One of the most exciting industry sectors in Vietnam continues to be retail. There are numerous reasons why this industry is particularly attractive to both domestic and foreign businesses. Among its positive attributes, the country has a well-developed economy that continues to improve, a high population (90+ million) and ever increasing living standards. Additionally important for the retail sector are statistics like the fact that 42 percent of Vietnamese are under the age of 25 and that there are a large amount of women (an important customer growth segment) in the workforce. Through November of this year, Vietnam’s total retail turnover reached VND 2,386 trillion (around US$113 billion), an increase of 12.6 percent year-on-year. Looking deeper at these numbers it is revealed that the trade sector saw a 12.2 percent year-on-year increase, hotel and restaurant services grew 15.3 percent, the service sector moved up by 13.4 percent, and the tourism industry saw a moderate growth of 1.8 percent. According to the Association of Vietnam Retailers (AVR), the country currently has around 750 supermarkets, 130 shopping centers and 9,000 traditional markets. The US Department of Agriculture’s Foreign Agricultural Service found that grocery retail sales in Vietnam have increased 130 percent since 2008. The USDA’s recent report on Vietnam’s retail sector identified a number of important trends for the future of the industry. Consumers will become more western-oriented in their mindsets – this will be particularly prevalent among the large amounts of young people in the country. This can already be seen in light of the fact that, over the past five years, the country has more than doubled the amount of food that it imports from overseas. There will also be an increasing acceptance of processed and packaged foods; this will be pared with more concerns about nutrition, quality, hygiene, and food safety. Vietnamese shoppers will find that they have increasing brand loyalty and begin to make weekly shopping trips instead of daily shopping trips they make now. FDI into Vietnam’s retail sector is at a strong level. Up until September of this year, the AVR recorded around 168 new FDI projects in the country with a total investment of around US$380 million. Due to World Trade Organization (WTO) concessions, Vietnam’s domestic market is now open to foreign competition. Retail companies are pushing aggressively into the country and have strong expansion plans for the future. Both Hanoi and Ho Chi Minh City are seeing large growth in their retail sectors due to their citizens’ growing levels of disposable income. Hanoi in particular has seen some major retail developments, for example the Vincom Mega Mall Royal City of Vingroup was recently completed during the third quarter of this year. Covering an area of 230,000 square meters, the shopping center has more than 600 stores featuring global luxury brands and more than 200 service and dining areas. Ocean Retail, a subsidiary of Ocean Group, recently opened their fifth Ocean Mart in Hanoi. The company has stated that, by 2015, it plans to become one of the biggest supermarket chains in Vietnam with more than 70 supermarkets. Son Ha Group recently opened their second Hiway in Hanoi, thus adding to its growing hypermarket chain. The Group plans to have 20 hypermarkets nationwide within the next five years. Other large retail firms that are expanding into Vietnam include Family Mart, Parkson, Lotte, and Circle K.
While the main growth in the retail sector comes from modern style retail firms, the traditional markets are still having a strong showing and remain competitive within the country. Modern retailing in Vietnam accounts for only 22 percent of the market, whereas in neighboring countries the numbers are much higher: for example 33 percent in the Philippines, 60 percent in Malaysia, and 90 percent in Singapore. Online shopping is also seeing strong growth. According to Nguyen Thanh Hung, general secretary of the Vietnam E-commerce Association, by 2017 turnover from online retail is predicted to reach US$8 billion. This is an immense level of growth given that, last year, online retail only accounted for US$700 million. Additionally, according to a survey cited by Hung, out of all of the people in the ASEAN region, the Vietnamese spend the most time on the internet. A key growth area in the e-commerce market is in providing the opportunity to purchase retail items using mobile devices. In the short-term, the e-commerce industry is likely to be held back by factors such as poor products and logistic systems, as well as the safety of information online. However, online retailers are racing to overcome these issues and take full advantage of this new market opportunity. Existing retailers are not the only ones trying to capitalize upon the opportunities that are present within Vietnam. A number of companies from a variety of business fields are also planning on entering the fast moving market. These other companies have seen the financial success that the existing retail companies have been having and are eager to get in on the action. A large portion of the new players in the retail sector are firms that come from Vietnam’s real estate investment sector. These real estate firms are often turning their unsold properties into retail locations. 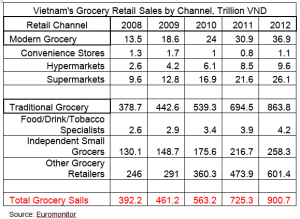 It is clear that the retail industry in Vietnam will be strong for some time to come.